The consequences of this "professionalization project" are examined using the discipline of academic philosophy as the "site" for the author's investigations. Methodologically unique, these investigations combine rhetorical analysis, protocol analysis, and the analysis of classroom discourse. The result is a complex portrait of how the participants in this humanistic discipline use their academic literacy practices to construct and reconstruct a great divide between expert and lay knowledge. This monograph thus extends our current understanding of the rhetoric of the professions and examines its implications for education. Contents: Preface. Part I: Core Concepts. 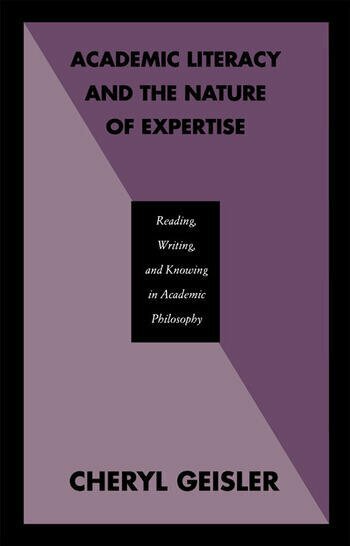 Literacy Among Experts in the Academy: The Academic Professions. Literacy Among Novices in the Academy: Students in School. Expertise as Cognitive Abstraction. Expertise as Professionalized Knowledge. Literacy and the Nature of Expertise. Part II: Studying Space and Time. Observing Writers with Protocol Data. Modeling Writing as Activity. Part III: Studies at a Single Site of Academic Literacy: Philosophical Ethics. Design and Analytic Framework for These Studies. The Genre of the Philosophic Essay: Transforming Readers' Experience. Composing the Philosophic Essay: Transforming Everyday Conversation. Representing Philosophical Ethics: Transforming Everyday Narrative. At the Boundaries of Expertise: Transforming Apprenticeship in an Instructional Situation. Part IV: Reflection and Reform. Reflecting on Academic Literacy. Reforming Academic Literacy. Appendices: Chronological Bibliography of the Cognitive Process Tradition. Directions for "Thinking-Aloud" Protocols. Interview Guide for Experts and Novices. Interview Guide for the Teacher. Interview Guide for the Students. The Career of William James. Participants' Final Texts. Rules for the Analysis of Text Structure. Chronological Listing of Participants' Narratives. Rules for Aggregating Conversational Interchanges. Coding the World of Discourse. Week-by-Week Analysis of the Class. "Geisler's review...is exemplary. It draws together work in such areas as the rhetoric of science, the nature of activity in the elementary school classroom, writing to learn, problem solving as a cognitive activity, and the history of the professions." "...offers a rich inquiry into the nature of expertise as a cultural phenomenon that should be of interest to teachers concerned with the historical organization of expertise in the academy and the ways in which this organization has provided for discontinuity between academic and indigenous literacy practices."